This article was written by Aimee Hicks with contributions by Ellys. Article edited by Donna Cromeans (@DJRiter). Article prepared for publication by Aimee Hicks. The 100 is a show that has an over-abundance of talent. The show has never seen a weak performance come out of its cast. While that is terrific, for the show as a whole it makes it difficult for individual performers to stand out. However, one performer made an impact from the very first moment she was on the screen and has never delivered anything other than top-notch powerhouse performances. That performer is Marie Avgeropoulos who portrays Octavia Blake. This season has been a phenomenal one for Avgeropoulos with the emergence of Blodreina who in many ways can be considered an alter-ego to Octavia. The way Avgeropoulos managed and maneuvered her way through this storyline showed her immense acting prowess. After four seasons of impeccable acting, the writers rightfully put her front and center this season giving her the opportunity to almost singlehandedly carry the majority of the core story. Blodreina was Octavia's way to survive the stress of the horrific situation that she was thrust into. Becoming Blodreina changed Octavia and while bits of the old Octavia popped in and out at times there was something missing. Octavia has always had a big heart despite her tough exterior, but with Blodreina a lot of that heart was missing. The way Avgeropoulos portrayed Blodreina showed that she was the cold-hearted version of the big-hearted warrior. The episode she won this title for was Damocles Pt. 1 (5x12) and it was, in many ways, the symbolic beginning of the end for Blodreina and the re-birth of Octavia Blake. Marie Avgeropoulos was exceptional in this episode and for all the reasons noted above, and will be coming below, she was extremely deserving of the title of July's Readers’ Choice Most Outstanding Performer of July. Octavia Blake, a withdrawn girl who spent her childhood hidden underground and behind a mask, has grown into a ferocious leader but is once again trapped underground and behind a mask, only now the mask is made of blood. For a character to simultaneously undergo radical transformation but not lose their essence, an especially powerful artist is required to play that character. Damocles Pt. 1 sends Octavia a reckoning that threatens to sever an illusion that has propelled her through years of horror. Avgeropoulos expertly walks the tightrope with the audience, as Octavia receives one abrupt jolt after another. The episode begins with Octavia marching at the head of her army, as Blodreina in all her power and glory. Everything proceeds according to plan, as the army approaches a gorge. They are close now, close to the fight. Blodreina turns and looks back at her people. It's a striking moment and not just because she has chosen to march minus her blood mask, but because of the relief, the brightness in her eyes, as she looks back. Avgeropoulos wipes every tension from Octavia's face for just a couple seconds. It's immediately apparent that in that instance she is thinking that it was all worth it and she will feel peace, knowing that this was the right decision. The peace is shattered by sudden gunfire, an ambush. Bullets smash into bodies on every side, but Octavia leaps behind a rock and shouts at her people to advance. As the survivors of the massacre flee she repeatedly tries to press forward, only to be snatched back by her brother Bellamy (Bob Morley). This whole scene was an intense moment for both the character and actress as chaos erupted all around. Avgeropoulos is no stranger to these sorts of chaotic fight scenes and she charged into the scene just as the audience would expect her character to do. Octavia’s strength most certainly comes from the heart of her warrior portrayer. 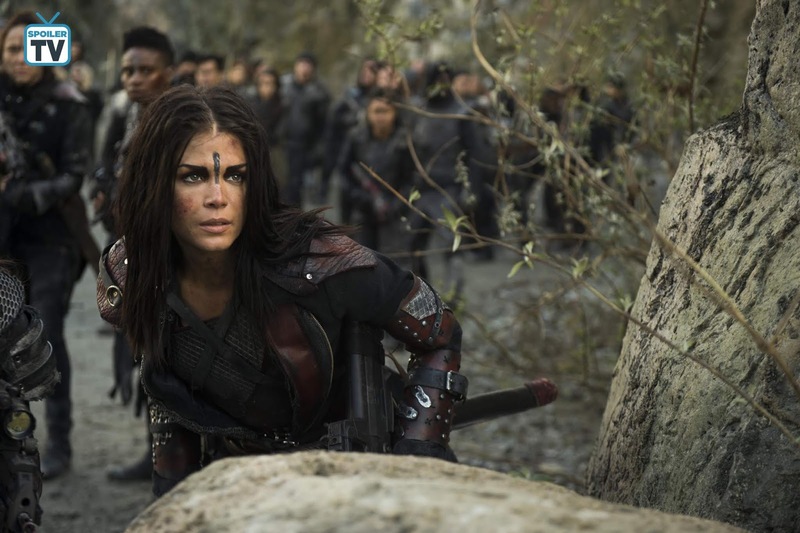 The scene comes to an end as a blast knocks them to the ground, but this is only the beginning of the complex journey that Octavia and Avgeropoulos would go on throughout this episode. After the dust had settled, Octavia was left unconscious next to Bellamy. As she came to, she was confronted by the reality of the horrific situation they were in. Her army was decimated and those left alive in the valley with them were doomed the second they moved. Bellamy was the last person Octavia wanted to be stuck with, but here they were. This was a tense scene and a bit of a revelatory moment for Octavia. It is a scene that had to be portrayed just right, because, in many ways, it was the beginning of the end of Blodreina's rule. The key to this scene was Bellamy being able to get through to Octavia and have his little sister realize the consequences of the decisions she has made. Avgeropoulos and Morley have had impeccable chemistry as siblings since the series began. The tension between their characters this season has made for some heartbreaking situations. In every Blake sibling confrontation, these two hit all the right emotional marks and this scene was no exception. It was tense, but the brutal honesty from Bellamy is what finally started to open Octavia's eyes. Avgeropoulos had to cover some intense revelations for Octavia while acting with her face plastered to the ground in a sandy gravely mix. At the start of the scene, she had to show Octavia's blind stubbornness to charge ahead despite the fact they had clearly lost. Then as people were gunned down in front of her and others tried to surrender, she had to convey the harsh truth that she was starting to accept, Bellamy was right, and her people would no longer follow her. At the end of the scene, Octavia lashes out at Bellamy and tries to hit him, as best she can with their movements limited, then turns away from him. That bit of lashing out was a nice touch by Avgeropoulos to show Blodreina losing control as Octavia started to resurface. The interaction there was very much reminiscent of early angry interactions between the Blake siblings. As the last line of the scene was spoken it was clear that Blodreina was out of moves and the only shot they had left was for Octavia to take over and try to redeem herself at all costs. The way Avgeropoulos handled all this in such a harsh environment was nothing short of magnificent. She said as much with her eyes and facial expressions as she did with her words. Morley was great in this scene, but Avgeropoulos was the star and she stood out. The fleeting vulnerability Octavia expresses doesn’t last very long as she Blodreina is still desperately looking for some way to save her people and remain in command. When Bellamy decides it’s safe to flee, Octavia's first reaction is for him to lay down "cover fire". She's all war business, still wanting to assume the aggressive position. Avgeropoulos portrayed Octavia as erratic and desperate, something more reminiscent of early-Octavia and not Blodreina. They do one run and tuck and roll, and Octavia grabs the nearest gun, telling Bellamy they’ll never make it past the tower lights. They’ve seen nothing but people gunned down at the slightest movement all day and all night, but she grabs the weapon, stares down the sight, and is desperate to fire it. At the last moment, Bellamy drags her off her perch, and they immediately discover Indra (Adina Porter) and a badly wounded Gaia (Tati Gabrielle) two more lives that Blodreina nearly extinguished. Octavia is set on saving Gaia, which prompts some surprise from the latter. Bellamy announces she's only doing it, in hopes that Gaia will convince the others to follow Octavia back through the gorge again. "If they don't everybody dies," is what Octavia says with her words, but Avgeropoulos delivers the line in a slightly pleading way. Her confidence of conviction is missing. The tone of authority weakened. Octavia is losing faith in herself. The complete dismissal from the people she truly cares about the most was, perhaps, the final blow that broke Blodreina. From here on out the warrior leader never really emerged again as the Octavia fans knew and loved began her final push to regain control. This was a complex scene with a lot of emotions and Avgeropoulos managed it all with precision and strength. Throughout this entire episode, she had to portray a character who was at war with herself as much as she was at war with her enemies. She not only accomplished that, but she made the audience feel Octavia’s struggle and pain. Under all the bravado of Blodreina exists Octavia and her big heart that does care more about people than she would care to admit. Hearing Bellamy tell her that she was only helping Gaia for her own selfish means triggered something in Octavia and that moment of trigger was captured in this brief flash of shock that passed through her eyes. A moment powerfully captured by Avgeropoulous. The next scene transitions from another character referring to Octavia as a killer, and being responsible for Wonkru's suffering. That fades into Octavia again staring through the sights of her gun, the steely determination in her eyes is that of someone who can and will take a life. The camera pulls back to reveal two details: Octavia is keeping watch at that moment and her eyes visibly tremble with emotion that she is trying to hide. When Gaia says that Wonkru isn't coming to save them because "Wonkru is broken", Avgeropoulos reacts with a shiver and a sharp breath. The sight of death coming so close and so slow for Gaia startles her. "Wonkru is broken. I broke it." She whispers to herself, but not so quietly that Indra doesn't hear and harshly agree. The audience knows that Octavia is not solely to blame for Wonkru's fate because others let her bear the burden of ensuring their survival. This was the moment of acceptance that the audience needed to hear from Octavia. Avgeropoulos portrayed this moment with such brutal honesty that Octavia’s remorse was palpable. She was not speaking empty words as she had earlier when trying to help Gaia. These words came from Octavia’s broken heart and Avgeropoulos made the audience feel the weight of Octavia’s pain. Avgelopoulos’ work in this episode largely consists of still moments where Octavia processes information. One look at her face and it’s clear what she’s thinking. Here she takes one deep breath, holds back a little horror, a little guilt, and a little desperation. At this moment, it’s clear that she's now taking a new burden: the burden of being responsible for Wonkru's destruction. Still trapped out in the dark, cold rain…. she surveys the piles of rocks, the piles of bodies, and it's as if she's seeing dead people for the first time. She can barely look away. She's overwhelmed. She sees movement. Her entire body tenses, then starts to spring up, grasping for that shred of hope...Bellamy pulls her down, as that survivor to is mowed down like the others. Frustration and anger ooze out as she accepts her fate. "What do you care if I die? Isn't that what you want?" Avgeropoulos does something very subtle yet brilliant here. The question is bitter and sharp, but the expression on her face isn't angry. It's a genuine plea for truth. And that's why Bellamy's affirmative reply cuts so deep. It's not that she genuinely believes Bellamy wants her dead; it's that he doesn't recognize enough of the sister he loves in the woman in front of him to refrain from saying something so cruel. And for a second Avgeropoulos has Octavia mourn what is lost, in a second of stunned silence before she turns back to keeping watch. Ever since the moments where they were pinned down, Octavia has been struggling to reconcile who she had become versus who she was. Octavia Blake and Blodreina battled for control of the situation. Ultimately, to survive, Octavia had to let go of Blodreina. To give those she truly does care about a fighting chance she had to sacrifice herself. This was Octavia's moment of redemption. For their entire lives, Bellamy has always said "My sister. My responsibility. ", but it was Octavia's turn to change that up and be the one to take responsibility for her brother and the situation they are in. What made this scene so poignant was the way Avgeropoulos portrayed it. She had this look of remorse and acceptance in her eyes that perfectly accompanied Octavia's apology to Indra and Gaia. Then when that moment between Octavia and Bellamy came, her eyes took on this emotional watery appearance and while her voice was strong there was a quiver of emotion within it. Octavia knows deep in her heart that her brother still loves her, but at the same time she knows she has done damage to their relationship that may not be repairable. At this moment Octavia was in many ways freeing Bellamy from the responsibility of being her brother and taking on the responsibility of being his sister. She knew this was a suicide mission, a mission that should have been her final act. This was her last goodbye. It was a powerful moment and in every single aspect of it, Avgeropoulos hit the perfect emotional beats. The scene was tense and poignant, and she gave it what it needed for the next scene to have the maximum impact possible. As Octavia charged out into the valley she was racing out to pay the ultimate price for her actions. She had accepted her fate and was prepared to embrace the consequences. If she was going down she was going down not only as a leader, but she was going to go out on her own terms. This was perhaps the most profound scene Avgeropoulos portrayed in this entire episode. There was so much emotion behind this scene and she brilliantly transitioned between Octavia's conflicting aspects of her personality as well as her conflicting emotions. When Octavia charged out that was the end of Blodreina. Avgeropoulos infused a wildness into Octavia's actions and declarations that made it clear that this was Blodreina making her final stand. Then when she ran out of bullets and was exposed, that was Octavia accepting her fate. She dropped to her knees as Octavia in surrender and acceptance of defeat, in deep contrast to Blodreina who swore to never surrender. She didn't necessarily surrender to her enemy, she knew they were going to kill her regardless, but she surrendered to her fate. Avgeropoulos made some exceptional acting choices at this moment, repeatedly transitioning between showing Octavia grimacing and looking at peace. Even in that final moment, there was still a war raging inside this natural born warrior and Avgeropoulos made sure it was evident. Finally, Octavia settled on being at peace just as help arrived. When she realized this wasn't her end she actually looked a bit shocked, and somewhat sad. 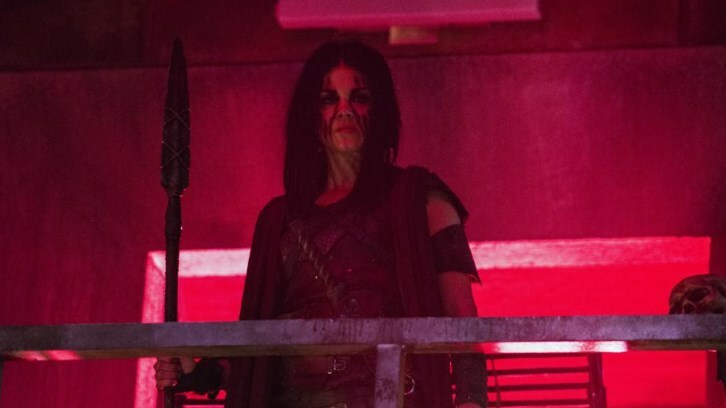 While Blodreina died in a blaze of glory in that last siege, Octavia Blake was left to deal with the demons left by Blodreina that had escaped the valley. Avgeropoulos was so exceptional in conveying all of this that it was impossible for the audience to not feel the emotion Octavia was experiencing. This whole episode was a tour-de-force for her, but her acting in this scene took her performance up to a whole new level. In an episode chock full of heartrending beautiful acting from Avgeropoulos, there's no more emotional scene in the episode than the group speeding to safety in the rover. For everyone else, there is joy and relief. For Octavia, it’s a poignant moment of being unsettled. One moment, she was sacrificing herself to finally purely save a life and shed her painful burdens in the process, the next she's alive, still carrying every ounce of them with her. Bellamy looks over at her. She tips back her head slightly as if to hold back all the tears brimming in her eyes. There is no Blodreina at that moment, only Octavia Blake, sister, and survivor. Throughout five seasons of The 100, Marie Avgeropoulos has been one of the most steadfast performers on the show. Season Five gave her some of her richest material to dig into and bring to life this new version of Octavia Blake. Blodreina was a phenomenal character and Avgeropoulos was absolutely brilliant in her performance of this fiercely protective bloodthirsty leader, but there was just something special about the return of the real Octavia Blake. The way Avgeropoulos chose to transition Blodreina back into Octavia showed a phenomenal control of performance. She was given terrifically written material, but it was the subtle choices she made in her performance that made the storyline really pop. By the end of the season, in many ways, Octavia was back to the lost young girl that the audience first met in the pilot who was just trying to figure out how she fit in. The only reason this intense arc worked throughout the season was because of how much heart and soul Avgeropoulos put into each performance. This dedication to her craft is why she is such a powerhouse performer. From intense fight sequences to heartfelt heartbreaking situations are what made Marie Avgeropoulos such a worthy winner of the title of SpoilerTV's Readers’ Choice Most Outstanding Performer of July. We did our best to cover all of Marie Avgeropoulos' brilliant work in Damocles Pt. 1, but please use the comments to discuss your thoughts on her performance in this episode and throughout Season Five.